Schools in Viet Nam Are Different from Blair H.S. I’m a new junior of Blair H.S. and new in the U.S. When I study in the U.S., I see differences between the schools in the U.S. and Viet Nam. One big difference is the clothes students wear at school and how they look. In my country all the students should wear a uniform when they go to school. Besides the uniform other things are different about how students can look in school For each school they make different rules to apply for all students in that school. In my school they didn’t allow boys to have long hair past their ears. For girls they didn’t allow them to have long or colored nails. Also students could wear only sandals. All the rules made us feel uncomfortable when we went to school in Viet Nam. But right here in the U.S. it doesn’t matter what kind of shoes we wear and we don’t have uniforms. Another difference is about rules for parents. When we began the year our parents had to go to a meeting in our class. If they did not go to that meeting, the students didn’t have a grade or report card from school. In my country it’s very important for parents to go to school meetings. The parents could get out of work when they had a school meeting. Getting to school in my country was different than in the U.S. The schools in my country didn’t have school buses for the students. The students went to school by themselves. Also they couldn’t use a student ID to ride a regular bus for free like we can at Blair. 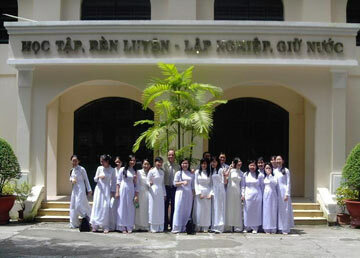 Students and thier Principal Stand in Front of Le Quy Don High School Which is located in Sai Gon, Viet Nam. There were schedule differences, too. A class period was only 45 minutes and we had only five periods for five days a week. When the bell rang, all the students just sat still in their classroom. We couldn’t move to a different room like we do at Blair. We waited for the teacher to come and then the next period began. We didn’t have a lunch time because after school most students went home but not all of them. Some students went out with their friends to play soccer. Maybe these students didn’t have much homework for each course. With me, I did my homework at night after dinner. I think all my friends did too. In Viet Nam, students couldn’t go to work to make their own money because we couldn’t find a job if we were under 18. That’s why in my country the students had a lot of free time. But in the U.S., many students I know usually work after school. This helps them make money to help them become more independent in their lives.